In response to another reader's question (seriously, you guys are so sweet, supportive and have such great ideas for posts), I'm talking about ways to avoid screen time in our house. I need to preface this by letting you know that we DO allow our kids screen time every day, and I have no problem with it at all. In fact, sometimes I think it can be a helpful tool in parenting. But, coming up with other ideas of what to do, is hard. 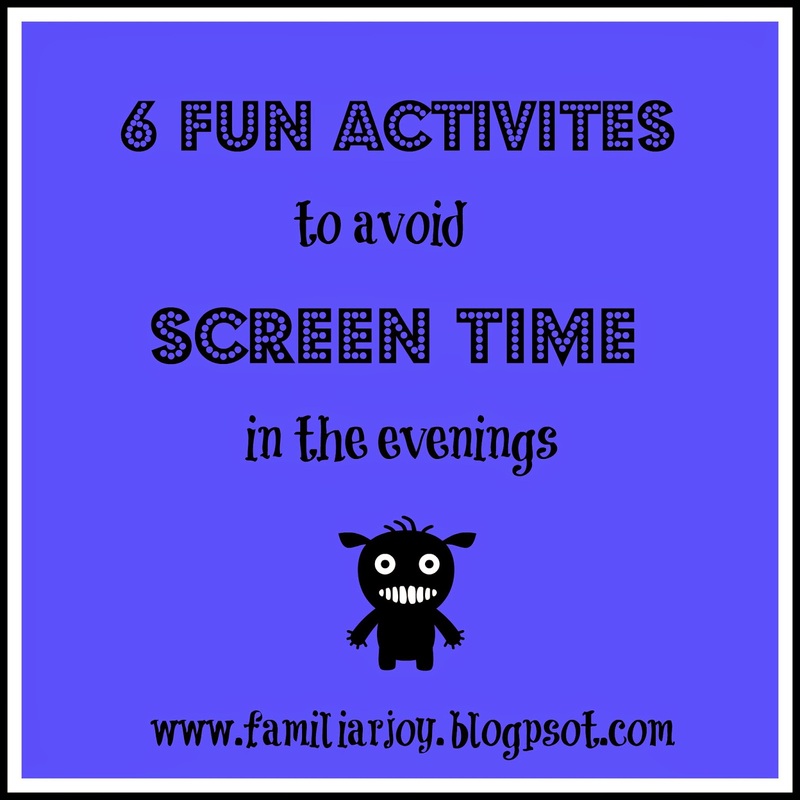 We tend to get stuck in a rut, bored of the same ole, and then turn to screen time because that's the only thing left you can think of...besides tearing your hair out because the kids are running around like maniacs or complaining of being bored. Or maybe that's just what happens at my house. Anyway, we had an amazing speaker at MOPS last year, who talked about the importance of kids working their large motor skills before they can move to the small motor and fine motor skills. This was such a brilliant wake-up call for me, as a mom. And it clicked. When kids are asked to sit and do homework, or they sit down in front of a screen, they are using their small motor and fine motor skills. What they need first is large muscle movement. 1. The chase game. Now, friends, we are very serious about this game at our house. If you ask any of our kids, "do you want to play the chase game?" The immediate response is squealing, screeching, giggling and asking where to line up. They love it. It's pretty much the game of tag, but inside. The adult starts and makes monster sounds while chasing the kids. Whoever gets tagged becomes it and they do the same. We can play this for 20-30 minutes, until everyone is panting and out of breath. No supplies required and it's fun for all ages. 2. Magic carpet rides. All you need for this is a large blanket. Preferably one you don't care much about. Place a child on the blanket and have the other kids, or you, pull them around the house. They LOVE it! Take turns and even have them double up on the edges while you are pulled around the house. 3. Scavenger hunt. When you are feeling lazy, but the kids have a lot of energy, (Um, hello..when is that not the case!?) this is the best game. Tell each child to go and find something in the house and bring it back to you. Assign a different object to each child. For example, something that keeps you warm, an object to clean yourself, something that starts with the letter T, etc. Make it hard for the older kids, easy for the younger ones. Once they bring you the object, they have to run it back to it's place before you assign them the next one. I know it sounds silly and easy, but my kids will play for an hour. I can sit and drink coffee on the couch while they run up and down the stairs, in search of random objects. Try it. 4. Scattered puzzle. Take a children's puzzle, with 25 pieces or less, and hide the pieces around the house. They can only find one piece at a time and have to run it down and lay it on the center of the floor. When all pieces are found, they work together to build the puzzle. This is great because they get completely worn out while searching for the pieces and then get a breather while they put it together. 5. Stair slide. I say this with caution because not everyone may like this one. But my kids LOVE it. Have them either sit on a blanket or a piece of cardboard at the top of the stairs, and slide on down. Diaper boxes work great for this. They need to be careful and obviously be supervised, but they will have a blast! 6. Dance party. This is a personal favorite of mine. We turn on the music super loud. Guessing our neighbors aren't quite as big of fans as we are. And we just dance! I'll pick them up and twirl them around. We make up our own moves, do whatever we feel like and probably look super silly, but it's fun. And that's what matters! Even my 9-year old isn't too cool for a good, old fashioned dance party in the living room. I use a kid friendly Pandora station...sometimes Disney and we get our groove on. It's even better if you know the words to the songs, so you can dance and sing together. Once they seem good and worn out, this is the time where you want to slow down to smaller motor skills. They can take a walk around the house, shake out their hands or even give neck rubs. A personal favorite of mine. Once they've completely calmed down, this is perfect time for them to sit and do their homework. My girls don't have homework yet, so they can color or sit and read. Yes, they will do that. A far cry from what my boys were like as toddlers. Typically homework takes 20-30 minutes and by that time, I'm starting to think about dinner. THIS, my friends, is the perfect time for screen time. I cook dinner, they can watch a show, play the wii or use their kindles. And everyone is happy. Once we've had dinner, most of the time, we keep the TV off for the rest of the night. Sometimes my boys will watch something, or play on their kindles, after the girls are in bed, but most of the time, our evenings are busy, and daddy is home so they want to spend time with him. Trying to put into place the idea of large motor, small motor, fine motor, has been extremely helpful with my kiddos, and I'm grateful for that piece of advice I received last year. As moms, we aren't perfect, and there are plenty of times when I have to rely on electronics to save my sanity. But, trying some of these techniques may help you through that time I call "the witching hour"...which is post-nap/school, until dinner time. We put our kids to bed earlier than most. (I will do a separate post on why), so evenings go quickly once dinner is done. Try these out, I can almost guarantee you'll see smiles and worn out kids! And for sure, less complaining. What more could we ask for!? Oh my gosh, we are SO taking magic carpet rides this afternoon! Isn't it fun?! One of my favorite indoor activities!